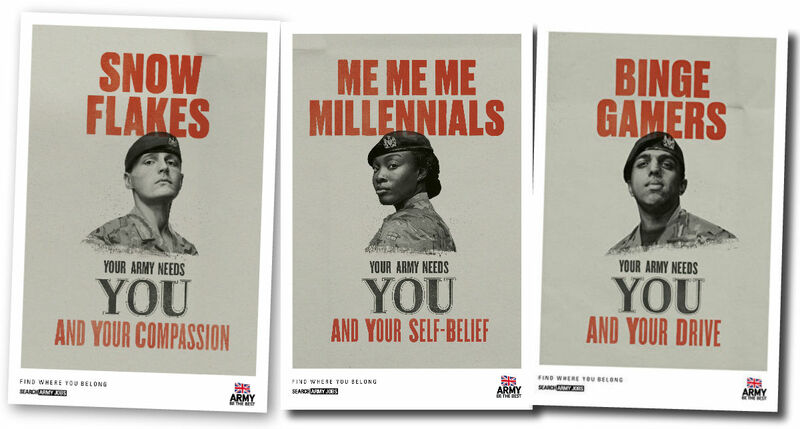 Three of the posters being used by the British Armed Forces to appeal to the next generation of recruits. The United Kingdom is finding military life to be a very tough sell to the next generation. In 2018, the British Armed Forces brought in just one in 10 of the recruits it needed. To change that, it has unveiled bold, retro-style recruitment posters aimed directly at millennials and generation Z. The posters are styled after campaigns used during the First World War and are accompanied by television advertisements. With the recent popularity of the Second World War’s “Keep Calm and Carry On” slogan, it’s probably not a bad move. The U.K. is hardly alone when it comes to finding citizens unwilling to don camouflage. The United States Army didn’t meet its recruitment goals in 2018 for the first time since the Iraq war was in full swing more than a decade ago, according to the New York Times. “The shortfall is due in part to a hot job market that has lured away many recruits at the time that President Trump and Congress seek to expand the military, and have raised the number the Army needs to meet,” it wrote. The goal was 76,500 new troops for 2018. But they missed the mark by 6,500 people — and that was after it spent an additional US$200 million on bonuses and lowered the standards to get into the service. Among the problems being cited is a rise in mental health issues, criminal convictions and obesity. Pay is also another significant factor. The lowest ranking American soldier earns $1,514 per month to start (all figures U.S.) — that’s just $18,168 per year. If you assume a 40-hour work week, that means new recruits are earning a paltry $9 an hour. It’s not hard to understand why young men and women aren’t lining up to serve when they’re being paid less to defend their country than they would make pouring a latte at Starbucks. The financial picture is similar in the U.K., where a recruit in basic training pulls in £15,230 annually and a private earns £18,859. By contrast, in Canada, a private starts at around $35,000, according to figures from the Department of National Defence. Many young people also see the military as out of step with their own personal values. They respect and honour those who serve, but don’t have the same call to duty to answer that the Greatest Generation did when Hitler roiled Europe 80 years ago. That’s not an indictment of this generation. My grandfather, who I have written about extensively in the past, proudly told me he served so future generations wouldn’t have to — that was his wish. But the military, be it in Canada, the U.S. or the U.K., plays an important role. It can be a tremendous force for good — helping out in natural disasters, serving as peacekeepers and providing a back stop to safety and security. It’s also an excellent place to develop discipline and leadership skills, which are useful far outside the barracks. All of which means we should all be concerned about ensuring enough people are attracted to the military as a career in peace time. “The army sees people differently and we are proud to look beyond the stereotypes and spot the potential in young people, from compassion to self-belief,” said U.K. Major-General Paul Nanson in an interview with The Guardian. In other words, the same thing every organization should want. This will be interesting to watch. We’ll know the results shortly — and it will tell us a lot about whether a really creative, outside-the-box recruitment campaign can fill an empty talent pipeline in an era where most employers simply post a job description online and hope for the best.